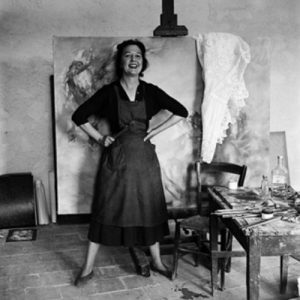 Dorothea Tanning was an American artist predisposed to Surrealism who found herself at the very eye of the storm. As a young artist working in New York in the 1930s, she had been struck by the explosion of Surrealism that was visible in some of the galleries. The 1936 exhibition at the Museum of Modern Art, Fantastic Art, Dada, Surrealism, was to prove a particular epiphany: while continuing to work as a graphic artist for clients such as Macy’s, Tanning began to work in a Surreal manner, eventually being represented by Julien Levy. It was through the dealer that she was to meet Max Ernst, whom she married a few years later in 1946. The next three and a bit decades were spent with Ernst in Sedona, Arizona, as well as Paris and the French countryside. After Ernst’s death, Tanning moved back to the United States. Tanning was a respected artist in her own right, enjoying a number of monograph exhibitions from the 1940s onwards. Many of her works, which often comprise surrealistic visions, are now in prominent museum collections such as the Art Institute of Chicago, LACMA, the Menil Collection, Houston, the Museum of Modern Art, New York, Tate, London and the Whitney Museum of American Art, New York. She wrote two well-received memoirs, Birthday and Between Lives. Tanning met Ernst after his flight from Europe: at the outbreak of the Second World War, he had been arrested first by the French in his adopted home and then again following the Occupation. He was eventually brought to the States, partly through the efforts of his third wife, Peggy Guggenheim. Ernst later visited Tanning’s studio to find works for an exhibition, Thirty-One Women, to be held at Art of This Century, the gallery owned by his then wife. Tanning’s famous self-portrait Birthday, now in the Philadelphia Museum of Art, was in the apartment; the picture showed Tanning with her top open against a backdrop of endless doors, a winged chimera in the foreground. The pair played chess in what was the prelude to Ernst’s last and longest-lasting relationship and marriage. He had moved in with Tanning within a short space of time. Tanning found herself at the heart of the vibrant, international art community that had sprung up, partly around the exiled European Surrealists. She became friends with many of these, including Joseph Cornell, with whom she had a long correspondence. A few years later, Tanning and Ernst moved to Sedona, Arizona, building a home that included spaces for their own studios. There and in France, the couple would entertain a host of figures from the arts, from Alexander Calder and Marcel Duchamp to Dylan Thomas. As Ernst was receiving increasing international recognition, he and Tanning travelled a great deal during this period—a factor that resulted in his having his status as a naturalised American citizen rescinded under the controversial McCarran-Walter Act. From this point, the couple was based primarily in France, in Paris and also in the countryside at Huismes, in a house that Ernst largely decorated, and then at Seillans, in a home that was more Tanning’s own work. In the 1950s, Tanning’s surreal pictures became more complex and dynamic as she created prismatic compositions, with planes of colour adding a kaleidoscopic energy. In 1969, her work took a new direction as she began to create sculptures modelled with cloth, a group of which were installed under the title Hôtel du Pavot, Chambre 202 at the Centre Georges Pompidou, Paris. After Ernst’s death in 1976, Tanning returned to the United States, continuing to work on a number of projects and in various media. As well as sculptures, prints and paintings, she also designed the sets and costumes for a number of theatrical productions, beginning with George Balanchine’s Night Shadow in 1945.